Over the weekend, a reader sent me links to not one but two new Cantor cranks! Sadly, one of them is the incoherent sort – the kind of nutjob who strings together words in meaningless ways. Without a certain minimal rationality, there’s nothing I can say. What I try to do on this blog isn’t just make fun of crackpots – it’s explain what they get wrong! If a crackpot strings together words randomly, and no one can make any sense of just what the heck they’re saying, there’s no way to do that. On the other hand, the second guy is a whole different matter. He’s making a very common mistake, and he’s making it very clearly. So for him, it’s well worth taking a moment and looking at what he gets wrong. My mantra on this blog has always been: “the worst math is no math”. This is a perfect example. First, I believe that Cantor derived a false conclusion from the diagonal method. This becomes clear if we do a two step version of the diagonal method. Step Two: Claiming to have a complete list of reals, Cantor uses the diagonal method to create a real number not yet in the list. Please, think about this two step model. The diagonal method does not show that the rational numbers are denumerable while the real numbers are not. The diagonal method shows that the assertion in step one is false. The assertion in step one is as false for rational numbers as it is for real numbers. The diagonal method calls into question the cross-section proof used to show that the rational numbers are the same size as the integers. Cantor didn’t talk about size. He never asserted anything about size. He asserted something about cardinality. That might sound like a silly nitpick: it’s just terminology, right? Wrong. What does size mean? Size is an informal term. It’s got lots of different potential meanings. There’s a reasonable definition of “size” where the set of natural numbers is larger than the set of even natural numbers. It’s a very simple definition: given two sets of objects A and B, the size of B is larger than the size of A if A is a subset of B. When you say the word “size”, what do you mean? Which definition? Cantor defined a new way of defining size. It’s not the only valid measure, but it is a valid measure which is widely useful when you’re doing math. The measure he defined is called cardinality. And cardinality, by definition, says that two sets have the same cardinality if and only if it’s possible to create a one-to-one correspondance between the two sets. When our writer said “Our finite notion of size just doesn’t extend to infinite sets”, he was absolutely correct. The problem is that he’s not doing math! The whole point of Cantor’s work on cardinality was precisely that our finite notion of size doesn’t extend to infinite sets. So he didn’t use our finite notion of size. He defined a new mathematical construct that allows us to meaningfully and consistently talk about the size of infinite sets. Throughout his website, he builds a complex edifice of reasoning on this basis. It’s fascinating, but it’s ultimately all worthless. He’s trying to do math, only without actually doing math. If you want to try to refute something like Cantor’s diagonalization, you can’t do it with informal reasoning using words. You can only do it using math. This gets back to a very common error that people make, over and over. Math doesn’t use fancy words and weird notations because mathematicians are trying to confuse non-mathematicians. It’s not done out of spite, or out of some desire to exclude non-mathematicians from the club. It’s about precision. Cantor didn’t talk about the cardinality of infinite sets because he thought “cardinality” sounded cooler and more impressive than “size”. He did it because “size” is an informal concept that doesn’t work when you scale to infinite sets. He created a new concept because the informal concept doesn’t work. If you’re argument against Cantor is that his concept of cardinality is different from your informal concept of size, you’re completely missing the point. This entry was posted in Cantor Crankery on March 24, 2014 by markcc. So, big announcement yesterday. Lots of people have asked if I could try to explain it! People have been asking since yesterday morning, but folks, I’ve got a job! I’ve been writing when I have time while running slow tests in another window, so it’s taken more than a day to get to it. other than finding life on other planets or directly detecting dark matter, I can’t think of any other plausible near-term astrophysical discovery more important than this one for improving our understanding of the universe. This is not an easy thing to explain, but I’ll do my best. We believe that the universe started with the big bang – all of the matter and energy, all of the space in the universe, expanding outwards from a point. There’s all sorts of amazing evidence for the big bang – not least the cosmic microwave background. But the big-bang theory has some problems. In particular, why is everything the same everywhere? That sounds like a strange question. Why wouldn’t it be the same everywhere? Here’s why: because for changes to occur at the same time in different places, we expect there to be some causal connection between those places. If there is no plausible causal connection, then there’s a problem: how could things happen at the same time, in the same way? That causal connection is a problem. To explain why, first I need to explain the idea of the observable universe. Right now, there is some part of the universe that we can observe – because light from it has reached us. There’s also some part of the universe that we can’t observe, because light from it hasn’t reached us yet. Every day, every moment, the observable universe gets larger – not because the universe is expanding (it is, but we’re not talking about the size of the universe, but rather of the part of the universe that we can observe). It’s literally getting larger, because there are parts of the universe that are so far away from us, that the first light they emitted after the universe started didn’t reach us until right now. That threshold, of the stuff that couldn’t possible have gotten here yet, is constantly expanding, getting farther and farther away. There are parts of the universe that are so far away, that the light from them couldn’t reach us until now. But when we look at that light, and use it to see what’s there, it looks exactly like what we see around us. The problem is, it shouldn’t. If you just take the big bang, and you don’t have a period of inflation, what you would expect is a highly non-uniform universe with a very high spatial curvurature. Places very far away shouldn’t be exactly the same as here, because there is no mechanism which can make them evolve in exactly the same way that they did here! As energy levels from the big bang decrease, local fluctuations should have produced very different outcomes. They shouldn’t have ended up the same as here – because there’s many different ways things could have turned out, and they can’t be causally connected, because there’s no way that information could have gotten from there to here in time for it to have any effect. Light is the fastest thing in the universe – but light from these places just got here. That means that until now, there couldn’t possibly be any connection between here and there. How could all of the fundamental properties of space – its curvature, the density of matter and energy – be exactly the same as here, if there was never any possible causal contact between us? The answer to that is an idea called inflation. At some time in the earliest part of the universe – during a tiny fraction of the first second – the universe itself expanded at a speed faster than light. (Note: this doesn’t mean that stuff moved faster than light – it means that space itself expanded, creating space between things so that the distance between them expanded faster than light. Subtle distinction, but important!) So the matter and energy all got “stretched” out, at the same time, in the same way, giving the universe the basic shape and structure that it has now. Inflation is the process that created the uniform universe. This process, which happened to the entire universe, had tiny but uniform fluctuations because of the basic quantum structure of the universe. Those fluctuations were the same everywhere – because when they happened, they were causally connected! Inflation expanded space, but those fluctuations provided the basic structure on which the stuff we observe in the universe developed. Since that basic underlying structure is the same everywhere, everything built on top it is the same as well. We’ve seen lots of evidence for inflation, but it hasn’t quite been a universally accepted idea. The next piece of the puzzle is gravity. Gravity at least appears to be very strange. All of the other forces in our universe behave in a consistent way. In fact, we’ve been able to show that they’re ultimately different aspects of the same underlying phenomena. All of the other forces can be described quantum mechanically, and they operate through exchange particles that transmit force/energy – for example, electromagnetic forces are transmitted by photons. But not gravity: we have no working quantum theory for how gravity works! We strongly suspect that it must, but we don’t know how, and up to now, we never found any actual proof that it does behave quantumly. But if it did, and if inflation happened, that means that those quantum fluctations during expansion, the things that provided the basic lattice on which matter and energy hang, should have created an echo in gravity! Unfortunately, we can’t see gravity. The combination of inflation and quantum mechanics means that there should be gravitational fluctuations in the universe – waves in the basic field of gravity. We’ve predicted those waves for a long time. But we haven’t been able to actually test that prediction, because we didn’t have a way to see gravitational waves. So now, I can finally get to this new result. They believe that they found gravity waves in the cosmic microwave background. They used a brilliant scheme to observe them: if we look at the cosmic microwave background – not at any specific celestial object, but just at the background – gravitational waves would created a very subtle tensor polarization effect. So they created a system that could observe polarization. Then they removed all of the kinds of polarization that could be explained by anything other than gravitational waves. What they were left with was a very clear wave pattern in the polarization – exactly what was predicted by quantum inflation! You can see one of their images of this wave pattern at the top of this post. Inflation happened. These gravity waves are an expected residue of inflation. They’re exactly what we would have expected if inflation happened, and we don’t have any other explanation that’s compatible with them. Gravity is quantum! If gravity wasn’t quantum, then expansion would have completely smoothed out the gravitational effects, and we wouldn’t see gravitational waves. Since we do see waves, it’s strong evidence that gravity really does have a quantum aspect. We still don’t know how it works, but now we have some really compelling evidence that it must! This entry was posted in Good Physics and tagged big bang, gravity waves, physics, quantum mechanics on March 18, 2014 by markcc. I was browsing around my crackpottery achives, looking for something fun to write about. I noticed a link from one of them to an old subject of one of my posts, the inimitable Miles Mathis. And following that, I noticed an interesting comment from Mr. Mathis about Monte Carlo methods: “Every mathematician knows that ‘tools’ like Monte Carlo are used only when you’ve got nothing else to go on and you are flying by the seat of your pants.” I find Monte Carlo computations absolutely fascinating. So instead of wasting time making fun of more of Mathis rubbish, I decided to talk about Monte Carlo methods. It’s a little hard to talk about Monte Carlo methods, because there’s a lot of disagreement about exactly what they are. I’m going to use the broadest definition: a Monte Carlo method is a way of generating a computational result using repeated computations and random sampling. In other words, Monte Carlo methods are a way of using random sampling to solve problems. I’ll start with a really simple example. Suppose you want to know the value of . (Pretend that you don’t know the analytical solution.) One thing that you could do is try to measure the circumference of a rod, and then divide it by its diameter. That would work, but it would be really hard to get much accuracy. You could, instead, get a great big square sheet of paper, and cover the whole thing in a single layer of grains of sand. Then, very carefully, you could remove the grains of sand that weren’t in the circle, compare it to the number of grains of sand that weren’t in the circle. By doing that, you could get a very, very accurate measurement of the area of the circle, and using that, you could get a much more accurate estimate of . The problem with that is: it’s really hard to get a perfect single-grain layer of sand all over the paper. And it would be a lot of very, very tedious work to get all of the grains that weren’t in the circle. And it would be very tedious to count them. It’s too much trouble. Instead, you could just take 1,000 grains of sand, and drop them randomly all over the circle and the square. Then you could count how many landed in the circle. Or ever easier, you could just go to a place where lots of drunk people play darts! Draw a square around the dartboard, and count how many holes there are in the square wall around it, versus how many in the dartboard! You’re not going to get a super-precise value for – but you might be surprised just how good you can get! That’s the basic idea of monte carlo simulation: you’ve got a problem that’s hard to compute, or one where you don’t know a closed-form solution to make it easy to compute. Getting the answer some other way is intractable, because it requires more work than you can reasonably do. But you’ve got an easy way to do a test – like the “is it in the circle or not” test. So you generate a ton of random numbers, and use those, together with the test, to do a sequence of trials. Then using the information from the trials, you can get a reasonable estimate of the value you wanted. The more trials you do, the better your estimate will be. The more you understand the probability distribution of the space you’re sampling, the better your estimate will be. For example, in the example above, we assumed that the grains of sand/darts would be distributed equally all over the space. If you were using the dartboard in a bar, the odds are that the distribution wouldn’t be uniform – there’d be many more darts hitting the dartboard than hitting the wall (unless I was playing). If you assumed a uniform distribution, your estimate would be off! That’s obviously a trivial example. But in reality, the Monte Carlo method is incredibly useful for a wide range of purposes. It was used during World War II by the Manhattan project to help design the first atom bomb! They needed to figure out how to create a critical mass that would sustain a nuclear chain reaction; to do that, they needed to be able to compute neutron diffusion through a mass of radioactive uranium. But that’s a very hard problem: there are so many degrees of freedom – so many places where things could proceed in several seemingly (or actually!) random directions. With the computers they had available to them at the time, there was absolutely no way that they could write a precise numerical simulation! But, luckily for them, they had some amazing mathematicians working on the problem! One of them, Stanislav Ulam, had been sick, and while he was recovering, fooled around with some mathematical problems. One of them involved a solitaire game, called Canfield. Ulam wanted to figure out how often the game of Canfield was winnable. He couldn’t figure out how to do it analytically, but he realized that since the deals of cards are a uniform distribution, then if you were to take a computer, and make it play through 1000 games, the number of times that it won would be a pretty good estimate of how many times the game was winnable in general. In that case, it’s obvious that a complete solution isn’t feasible: there are 52! possible deals – roughly ! But with just a couple of hundred trials, you can get a really good estimate. Ulam figured that out for the card game. He explained it to Jon von Neumann, and von Neumann realized that the same basic method could be used for the Neutron diffraction process! Since then, it’s been used as the basis for a widely applicable approach to numeric integration. It’s used for numerous physics simulations, where there is no tractable exact solution – for example, weather prediction. (We’ve been able to get reasonably accurate weather predictions up to six days in advance, using very sparse input data, by using Monte Carlo methods!) It’s an incredibly useful, valuable technique – and anyone who suggests that using Monte Carlo is in any way a half-assed solution is an utter jackass. I’ll finish up with a beautiful example – my favorite example of combining analytical methods with Monte Carlo. It’s another way of computing an estimate of , but it gets a more accurate result with fewer trials than the sand/darts. It’s based on a problem Buffon’s needle. Buffon’s needle is a problem first proposed by the Count of Buffon during the 1700s. He asked: suppose I drop a needle onto a panelled wood floor. What’s the probability that the needle will fall so that it crosses a one of the joints between different boards? Using some very nice analytical work, you can show that if the panels have uniform width , and the needle has length , then the probability of a needle crossing a line is: . That gives us the nice property that if we let , then the probability of crossing a line is . Using that, you can do a Monte Carlo computation: take a sheet of paper, and a couple of hundred matchsticks. Draw lines on the paper, separated by twice the length of a matchstick. Then scatter the matchsticks all over the paper. Divide the total number of matchsticks by the number that crossed a line. The result will be roughly . For example – with 200 trials, I got 63 crossing a line. That gives me roughly 3.17 as an estimate of . That’s not half-bad for a five minute experimental estimate! This entry was posted in probability and tagged numerical methods, numerical simulation, probability on March 16, 2014 by markcc. In topology, we always talk about the idea of continuous deformation. For example, we say that two spaces are equivalent if you can squish one into the other – if your space was made of clay, you could reshape it into the other just by squishing and molding, without ever tearing or gluing edges. That’s a really nice intuition. But it’s a very informal intuition. And it suffers from the usual problem with informal intuition: it’s imprecise. There’s a reason why math is formal: because it needs to be! Intuition is great, as far as it goes, but if you really want to be able to understand what a concept means, you need to go beyond just intuition. That’s what math is all about! We did already talk about what topological equivalence really is, using homeomorphism. But homeomorphism is not the easiest idea, and it’s really hard to see just how it connects back to the idea of continuous deformation. 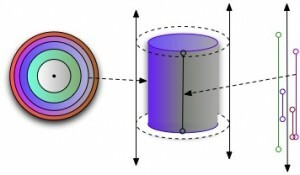 What we’re going to do in this post is look at a related concept, called homotopy. Homotopy captures the idea of continuous deformation in a formal way, and using it, we can define a form of homotopic equivalence. It’s not quite equivalent to homeomorphism: if two spaces are homeomorphic, they’re always homotopy equivalent; but there are homotopy equivalent spaces that aren’t homeomorphic. How can we capture the idea of continuous transformation? We’ll start by looking at it in functions: suppose I’ve got two functions, and . Both and map from points in a topological space to a topological space . What does it mean to say that the function can be continuously transformed to ? We can do it using a really neat trick. We’ll take the unit interval space – the topological space using the difference metric over the interval from 0 to 1. Call it . can be continuously deformed into if, and only if, there is a continuous function , where . If that’s true, then we say is a homotopy between and , and that and are homotopic. That’s just the first step. Homotopy, the way we just defined it, doesn’t say anything about topological spaces. We’ve got two spaces, but we’re not looking at how to transform one space into the other; we’re just looking at functions that map between the spaces. Homotopy says when two functions between two spaces are loosely equivalent, because one can be continuously deformed into the other. To get from there to the idea of transformability of spaces, we need to think about what we’re trying to say. We want to say that a space can be transformed into a space B. What does that really mean? One way to say it would be that if I’ve got , I can mush it into a shape , and then much it back to , without ever tearing or gluing anything. Putting that in terms of functions instead of squishies, that means that there’s a continous function from to , and then a continous function back from to . It’s not enough just to have that pair of functions: if you apply to map to , and then apply to map back, you need to get back something that’s indistinguishable from what you started with. Formally, if and are topological spaces, and and are continuous functions, then the spaces and are homotopically equivalent – equivalent over squishing and remolding, but not tearing or gluing – if is homotopic with the id function on , and is homotopic with the id function on . That captures exactly the notion of continuous transformation that we tried to get with the intuition at the start. Only now it’s complete and precise – we’ve gotten rid of the fuzziness of intuition. This entry was posted in Topology (take 2) and tagged homotopy, Topology on March 13, 2014 by markcc. When people talk informally about topology, we always say that the basic idea of equivalence is that two spaces are equivalent if they can be bent, stretched, smushed, or twisted into each other, without tearing or gluing. A mug is the same shape as a donut, because you can make a donut out of clay, and then shape that donut into a mug without tearing, punching holes, or gluing pieces together. A sphere is the same shape as a cube, because if you’ve got a clay sphere, you can easily reshape it into a cube, and vice-versa. Homeomorphism is the actual formal definition of that sense of equivalence. The intuition is fantastic – it’s one of the best informal description of a difficult formal concept that I know of in math! But it’s not ideal. WHen you take a formal idea and make it informal, you always lose some details. What we’re going to do here is try to work our way gradually through the idea of transformability and topological equivalence, so that we can really understand it. Before we can do that, we need to be able to talk about what a continuous transformation is. To talk about continuous transformations, we need to be able to talk about some topological ideas called homotopy and isotopy. And to be able to define those, we need to be able to use topological products. (Whew! Nothing is ever easy, is it?) So today’s post is really about topological products! The easiest way that I can think of to explain the product of two topological spaces is to say that it’s a way of combining the structures of the spaces by adding dimensions. For example, if you start with two spaces each of which is a line segment, the product of those two spaces is a square (or a circle, or an octagon, or …) You started with two one-dimensional spaces, and used them to create a new two-dimensional space. If you start with a circle and a line, the product is a cylinder. In more formal terms, topological products are a direct extension of cartesian set products. As the mantra goes, topological spaces are just sets with structure, which means that the cartesian product of two topological sets is just the cartesian products of their point-sets, plus a combined structure that preserves attributes of the original structure of the spaces. Let’s start with a reminder of what the cartesian product of two sets is. Given a set and a set , the cartestian product is defined as the set of all possible pairs , where and . If and , then . In category theory, we take the basic idea of the cartesian product, and extend it to a general product of different mathematical objects. It does this by using the idea of projections. In this model, instead of saying that the product of sets and is a set of pairs , we can instead say that the product is a set of objects, and two functions and . (To be complete, we’d need to add some conditions, but the idea should be clear from this much.) Given any object in the the product set , will give us the projection of that object onto . This becomes more interesting when we consider sets of objects. The A-projection of a collection of points from the product set is the shadow that those points cast onto the set A. A topological product is easiest to understand with that categorical approach. The set of points in a product category is the cartesian product of the sets of points in and the sets of points in . The trick, with topologies, is that you need to describe the topological structure of the product set: you need to be able to say what the neighorhoods are. There are lots of ways that you could define the neighborhoods of the product, but we define it as the topological space with the smallest collection of open-sets. To understand how we get that, the projections of the category theoretical approach make it much easier. Informally, the neighborhoods in the product are things that cast shadows into the topological spaces and which are neighborhoods in and . Suppose we have topological spaces A and B. If is the product topology , then it has projection functions and . The projection functions from the product need to maintain the topological structure of the original topologies. That means that the projection function must be continuous. And that, in turn, means that the inverse image of the projection function is an open set. So: for each open set in , is an open-set in . Let’s look at an example. We’ll start with two simple topological spaces – a cartesian plane (2d), and a line (1d). In the plane, the neighborhoods are open circles; in the line, the neighborhoods are open intervals. I’ve illustrated those below. The product of those two is a three dimensional space. The neighborhoods in this space are cylinders. If you use the projection from the product to the plane, you get open circles – the neighborhood structure of the plane. If you use the projection from the product to the line, you get open intervals – the neighborhood structure of the line. One interesting side-point here. One thing that we come across constantly in this kind of formal math is the axiom of choice. The AoC is an annoying bugger, because it varies from being obviously true to being obviously ridiculously false. Topological products is one of the places where it’s obviously true. The axiom choice is equivalent to the statement that given a collection of non-empty topological spaces, the product space is not empty. Obvious, right? But then look at the Banach-Tarski paradox. This entry was posted in Topology (take 2) on March 5, 2014 by markcc.